Created with special, easy and time-saving features, the Horizon Memory Craft 9400 is unlocking limitless possibilities for quilters to escape into a world of pure creativity. Quilters now have a full 11″ of bed space to the right of the needle to store extra fabric from a quilt. In addition, quilters can enjoy exceptionally smooth quilt piecing with the included Acufeed™ Flex layered fabric feeding system; achieve faster performance with a sewing speed of 1,060 SPM and view their work, shadow-free, with the machine’s retractable High Light™. Navigation through all of these features has become easier with the mc9400’s new LCD color touchscreen. More room for all your quilt projects. The 9400 provides 11” to the right of the needle and 15 ½” of total work area. The needle area is sleek and trim so you can easily see as you work. 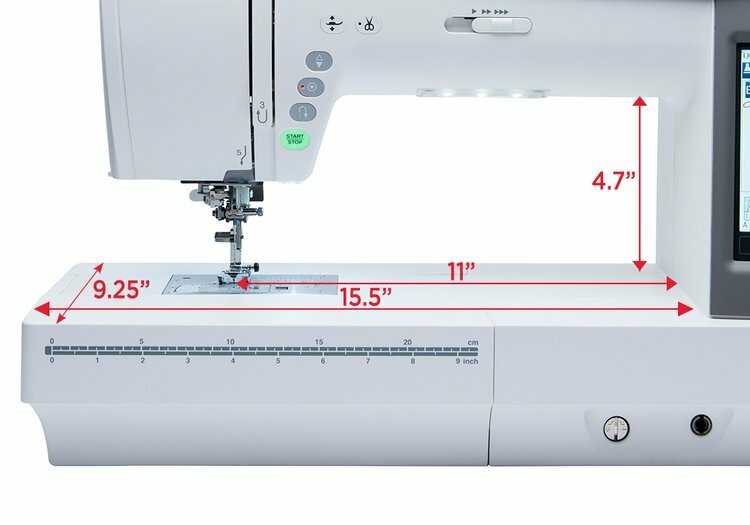 The Memory Craft 9400 features an extra-large foot control for greater stability and surface area when sewing. It also includes a thread cutter pedal which allows you to snip threads with your foot, so you don’t have to remove your hands from your fabric. Customize, resize, combine and save the 350 built-in stitches on the horizon memory craft 9400. The large LCD touchscreen makes it easy to edit, and you can make combinations up to 100 stitches long. Store the stitches in the built-in memory banks, or on a USB drive right from the machine. The Horizon Memory Craft 9400 offers an unbelievable 91 needle positions. This allows for more detail in decorative stitches, and incredible fine adjustments in all stitch creation. And with 9mm stitch width, this sort of bold detail can be easily appreciated. Threading couldn’t be easier! Set your thread, push the lever, release and sew! This time saving feature allows you to get sewing faster. Its advanced design feeds the thread through the eye of the needle with precise accuracy every time. The Horizon Memory Craft 9400 features a wide variety of amazing light – right where you need it most. Our High Light™ is activated by pulling it forward. The adjustable light provides a beacon that directs light right to the needle, so you can see your stitches with clarity. Ten ultra–bright LED lights in five locations illuminate the bed of the machine, providing a dazzling work area. Even the function buttons are illumined – so they’re easy to find and easy to use. Finishing your projects from start to finish is a feeling that can’t be matched – especially when your project is a quilt! 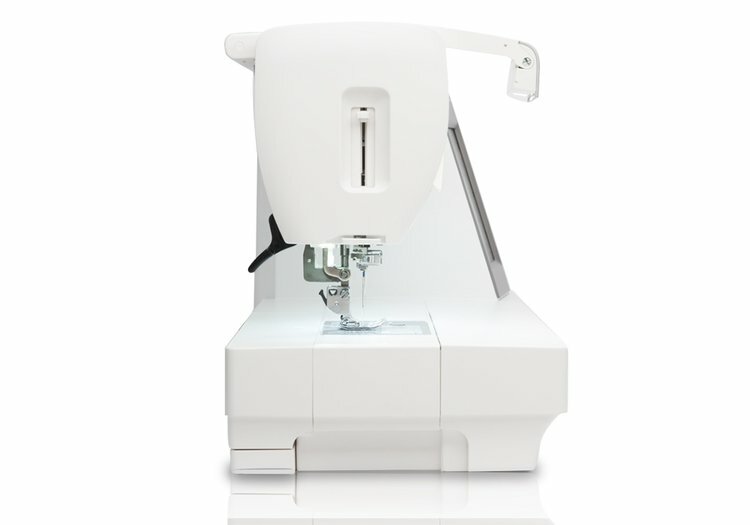 The Horizon Memory Craft 9400 makes free motion quilting easier than ever. Customize the foot height for your project and preference – set it high for a lofty quilt with lots of batting, or low if you like a little drag on your stitches. You can even memorize your setting to use later. Set the speed for comfortable sewing. This slider allows you to set the top speed of the machine. Set to slower speeds for intricate work, high speeds for long straight seams. 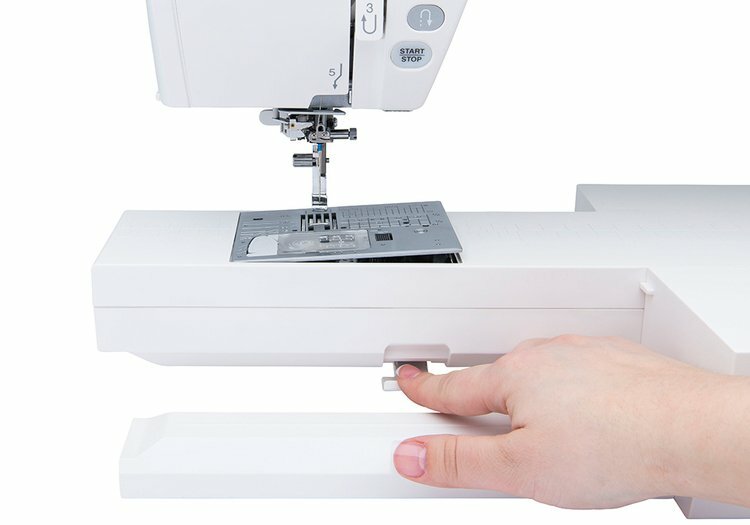 A popular feature for beginners – never sew faster than your comfort zone. Setting to the slow speed is also popular for appliqué work. Can be set as high as 1060 spm or as low as 60 spm. 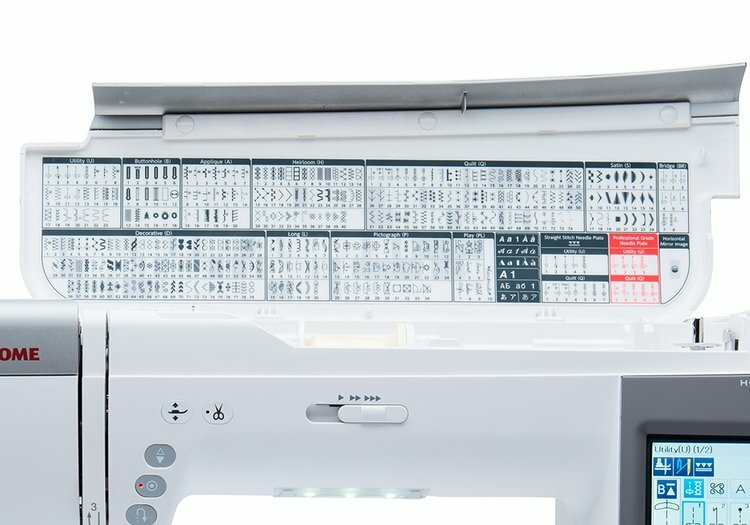 The Advanced Touchscreen shows all of the information you need to sew with ease. Select new stitches and memorize your favorites for quick access. The sewing applications feature gives you guidance for perfecting a variety of sewing tasks. With memorized quilt seaming, the machine remembers the length of your seam, so you can cruise through stitching a large number of the same size blocks. The standard cloth guide snaps right onto the bed of the machine. It slides to your desired hem or seam width, then stays in place so that you can easily sew with your fabric along the raised flange on the guide. Use the markings on the bed of the machine for accurate measurement and placement. 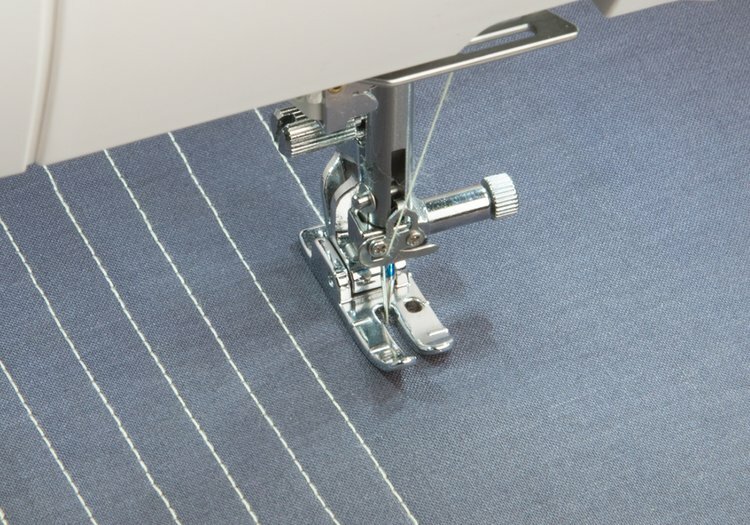 Automatically lifts the presser foot after a thread cut – when the thread snip button is pressed, or after a programmed thread cut at the end of a row of decorative stitches – allowing you to keep your hands on your project at all times. It can also be set to raise at the end of any seam, with the needle in the down position for easy pivoting. 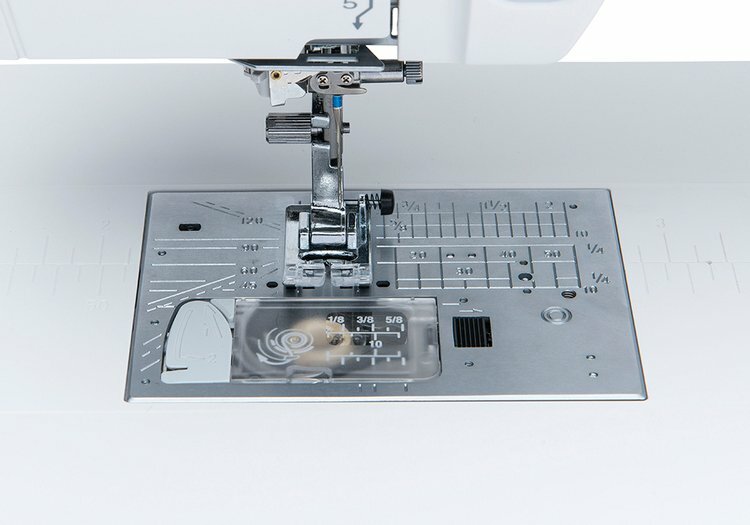 This great feature simplifies the sewing process – you have less manual steps to save time and increase efficiency. When quilting or sewing large projects, it is sometimes difficult to keep track of how much bobbin thread is left. The bobbin thread sensor alerts you when your bobbin thread is running low – so you’re never caught in the middle of a seam or line of decorative stitches. The Horizon Memory Craft 9400 has an advanced sensor system which allows you to set the level of sensitivity for the alert. This feature is also very helpful for sewing with different thread thicknesses. You can increase the sensitivity when using a thick bobbin thread, and lower it for thin threads. A button is placed into the gauge of a special foot for buttonhole formation. The foot works with a sensor on the machine to create a perfectly-sized buttonhole. This creates quick, easy buttonholes of an accurate size for the button of choice. 11 built-in buttonholes including a 9mm wide style. A fabric sensor automatically detects the thickness of fabric, and adjusts the downward pressure placed on the fabric accordingly. This ensures that your fabric never slips, yet moves smoothly and easily as you sew. The presser foot pressure can also be adjusted manually in the setting mode. This allows you to reduce the pressure on thicker fabrics, or to set to your own personal preferences. The knee lift has been designed to make it ergonomic and adjustable to accommodate sewists of most any size or height. You can now sit directly in front of the needle with the knee lift perfectly positioned for free-motion quilting, variable zig zag, or general sewing. Our Acufeed™ Flex layered fabric feeding system has long been legendary in the sewing and quilting world for its amazing precision and power. The Acufeed™ Flex system is removable – when not in use, simply store it in one of the ample accessory trays. Adding and removing the optional feet is easy! Acufeed™ Flex comes in two useful options. The standard two-pronged Acufeed™ feet advance fabric flawlessly from the top and bottom. Use this system for quilting, seaming, and traditional sewing. Our optional one-pronged Acufeed™ feet give precise control for more detailed work, like installing zippers and matching seams. The unique Stitch Composer™ program gives you the ability to create your own stitch patterns from scratch! 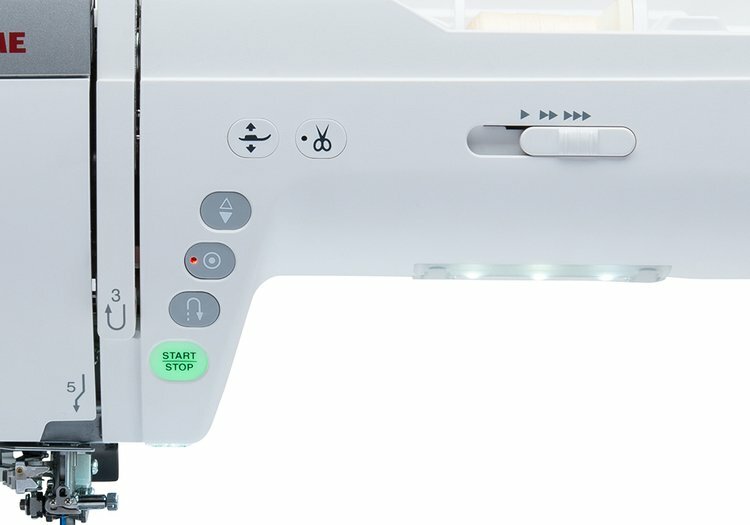 The program is easy to use, and transferring stitches to your machine is easy using the built-in USB port. The specially designed bobbin case and cover mean there’s no need to pull long thread tails up when you first thread the machine. Slip the bobbin thread in the cover plate guide; the built in cutting blade trims the tail to the correct length for a super-clean start to your stitching line. After the initial threading, the auto-thread cutter takes care of trimming and re-setting the tails each time. The new bobbin winder plate has five cutting blades. Faster and smoother winding, easy thread cutting, and your bobbin is ready to go! That’s right – you can create 9mm wide stitches on the horizon memory craft 9400! The extra width makes all of your decorative stitches bolder, brighter, and more distinct. Wider, more distinct stitches allow you to fill more area with stitching, quicker – saving you valuable time while sewing. Using the right tools at the right time is important in sewing. When using lightweight fabrics, or piecing quilts, a straight stitch needle plate makes all the difference. Our One Step™ Plate Converter allows you to easily switch and use the perfect plate for your project. Simply press a button to release one plate; then snap a new one in place – it takes only seconds, with no screwdrivers required! In addition to the standard zig zag needle plate and the straight stitch needle pate, the 9400 also includes a professional ¼” needle plate and foot. This industrial style foot and plate work together for perfectly precise stitches. 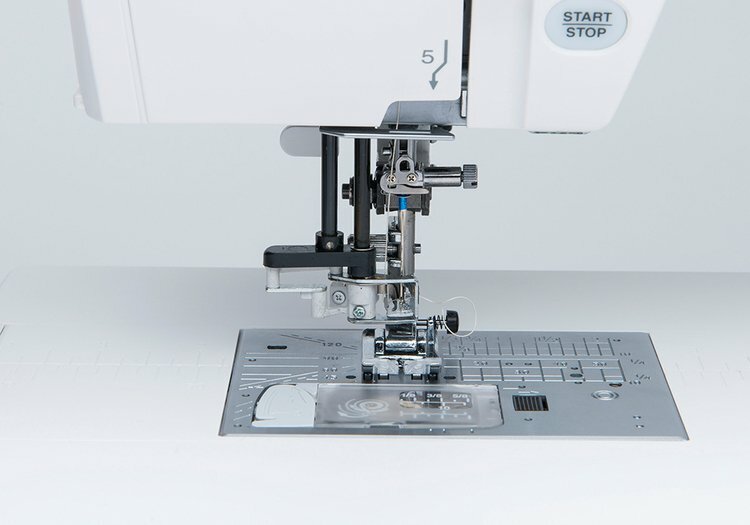 This system also includes a sensor that will only allow a straight stitch to be sewn when the straight stitch needle plate is in place, so you never have to worry about breaking a needle. All three needle plates are included as standard accessories. Advanced tools give advanced abilities for creative expression. The Horizon Memory Craft 9400 includes a great tool for creativity: Variable Zig Zag™. This feature enables precision control over the stitch width via the knee lift! Thread painters will rejoice at the ease of control of the stitch width. Begin with a straight stitch, then while the machine is still running, press against the knee lifter to widen your stitch to a 9mm zigzag. Release pressure to gradually return to a straight stitch for a tapered finish. Don’t want a 9mm stitch? You can easily control the maximum width of the stitch setting in the machine’s set mode. This advanced control opens up amazing new possibilities for creation expression with free motion quilting, thread painting, raw edge appliqué, free motion monogramming, and more. The needle stops in the down position for easy pivoting on corners and for seamless free motion embroidery. Press to raise the needle to the up position for easy fabric removal. More Stitches, More Accessories, More Options! 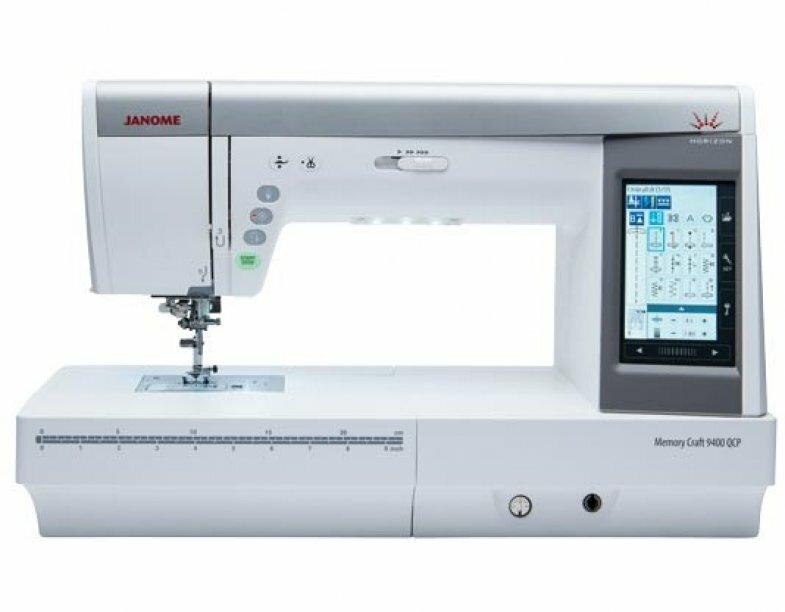 The Horizon Memory Craft 9400 includes an amazing array of built-in stitches and embroidery designs. You’ll find 350 built-in stitches, including 11 different styles of buttonholes (and with stitch composer your stitch count is infinite). Four fonts provide variety for decorative stitch monogramming. The machine includes 19 standard feet and accessories.